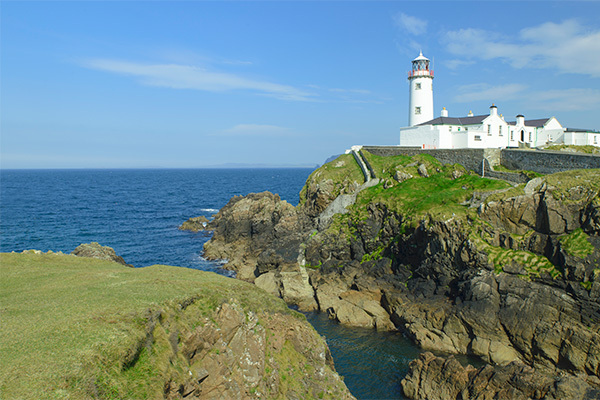 When land meets sea and nature and beauty collide, the result is a varied and majestic coastline unique to the western seaboard of Ireland; the home of the Wild Atlantic Way. 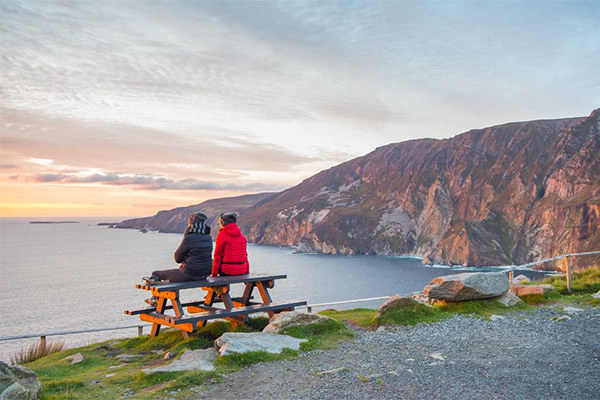 Full of sweeping sandy beaches, sheer cliffs, ancient forts and rocky outcrops, the Wild Atlantic Way is the longest defined coastal touring route in the world and stretches 2,500km over 7 counties from Co. Donegal at its most northerly point, to Co. Cork as its southern point. 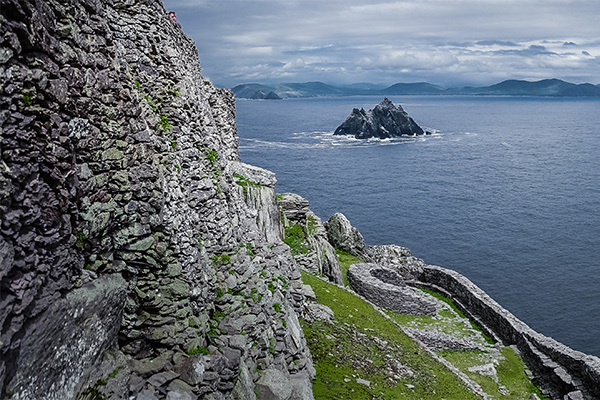 The well-signed, easy-to-navigate touring route includes 188 Discovery Points, where visitors can stop and learn more about the must-sees and hidden local gems like Derriglimagh in Connemara Co. Galway and its transatlantic connection or Co. Kerry’s otherworldly Skellig Islands. At 2,500km there is a lot to discover, whether exploring it from end-to-end, or dip into it as the mood strikes. The route has been zoned into a number of specific areas to allow visitors to explore more from majestic headlands of sheer granite cliffs pounded by invigorating surf, to island escapes and idyllic peninsulas boasting a UNESCO World Heritage Site – discover the unique regions of the Wild Atlantic Way. Culture, creativity, music, epic adventures and unforgettable, sometimes life–changing, experiences await you. Start your journey now. And it’s enveloped by the famed Irish welcome, discover a unique destination that leaves visitors renewed, uplifted and refreshed. 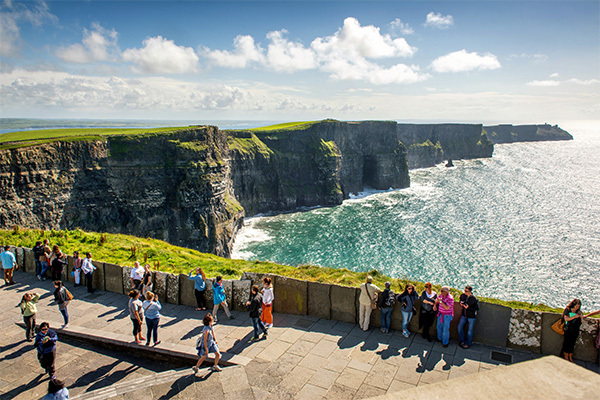 Enveloped by the famed Irish welcome, discover a unique destination that leaves visitors renewed, uplifted and refreshed. Untouched, off-radar and crying out for exploration, this rugged and remote area marks the north-western contour of the Wild Atlantic Way, Co. Donegal. Nature is the star here, from the sheer granite walls of some of Europe’s highest sea cliffs at Slieve League, to Northern Lights dancing in clear winter skies. But there’s warmth and wit to be found among the vibrant, Irish-speaking community. This is a place that will lift your spirit. 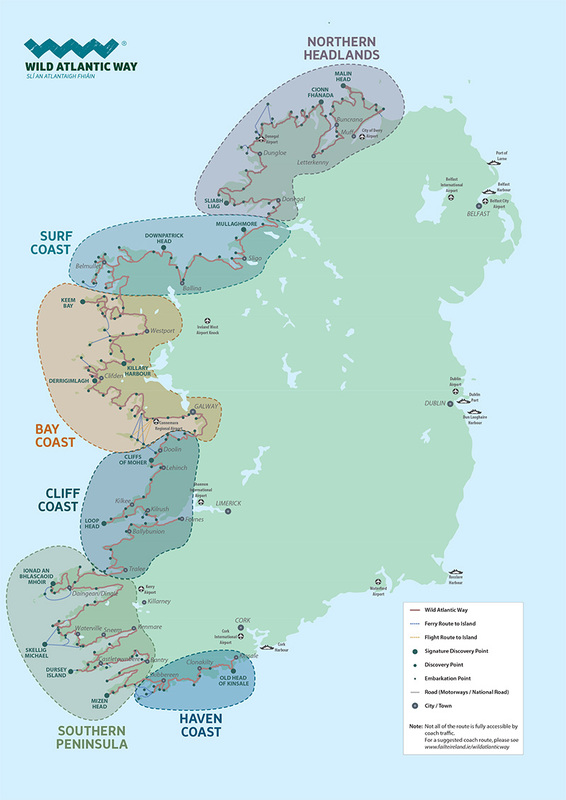 The jagged stretch of the Wild Atlantic Way, leads from Donegal Town through Co. Sligo to far-flung Erris in Co. Mayo. But that’s only the beginning. Voted Ireland’s ‘Best Place to Go Wild’, coastal hubs like Bundoran, Mullaghmore, Enniscrone and Strandhill are renowned for their surf – throwing up both beginner-friendly ripples and monster slabs that attract some of the world’s top wave riders. There’s a cultural richness along the Surf Coast too, from the Neolithic Céide Fields to a lively festival scene and, of course, the legacy of poet WB Yeats, who immortalised the landscapes of his childhood in some of his best known works – including the Lake Isle of Inishfree. From distant Erris in Co. Mayo to Connemara in Co. Galway the Wild Atlantic Way skims south around huge bays. The largest of these – Clew Bay – is said to have 365 islets and islands, one for every day of the year. In Connemara, water and land merge in a lacy shoreline of loughs, coves, islands and bogs. The Bay Coast is a salty, open-air playground, loaded with dazzling beaches and Blueway trails, with opportunities to kayak, kite-surf, paraglide, swim and dive. Cyclists follow the Great Western Greenway – one of the world’s most scenic cycleways. Walkers climb the sacred Croagh Patrick and Twelve Bens range. There’s history and culture too: elegant Georgian Westport House; the stronghold of legendary pirate queen Grace O’Malley on Clare Island… and Connemara’s Derrigimlagh Bog – where the world’s first transatlantic flight landed. Speaking about the Cliff Coast, Lonely Planet said, “The land is hard, the soul is not.” It’s here that Ice-Age landscapes meet west-coast warmth and unbroken views connect the mountains to the islands that dot the Atlantic. Improbable landscapes like The Burren and the Cliffs of Moher hum with rare plants, puffin colonies and dolphins, while Nobel Prize-winning poet Seamus Heaney described it as a place that can “catch the heart off guard and blow it open.” Enough said. This striking seaboard is a place for cliff-top walks, island-hopping, glowing pubs, rich waves of traditional music and soul stirring views. This is as far west as Ireland gets: “next parish Manhattan”, as they say. And there’s a distinctly edge-of- the-world feel to the Southern Peninsulas, as both the mainland and everyday life are left far behind. 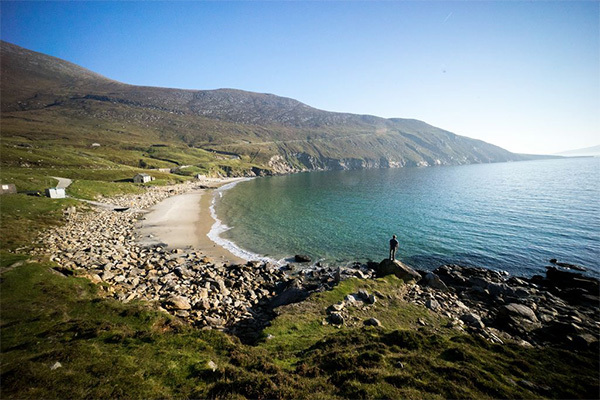 The five great peninsulas – Dingle, Iveragh, Beara, Sheep’s Head and Mizen – stretch miles out into the ocean. Breathtaking views unfold at every turn here. Make friends with whales and dolphins, take a cable car over a crashing ocean, or stargaze under Ireland’s darkest skies. Whatever you do, you will leave the ordinary far behind. 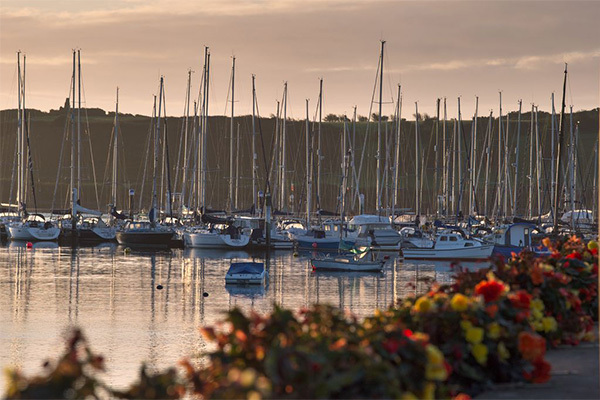 Jig zagging gently from dreamy Bantry Bay through Skibbereen and on to Kinsale, the Haven Coast is perfectly named. Hedgerows thick with fuschia and monbretia border lush gardens; endless inlets and Blue Flag beaches promise long days spent relaxing in the salty air. By hundreds of inlets, coves, safe harbours and Blue Flag beaches just right for long days spent in the salty air… beachcombing, island hopping, whale-watching, learning to sail, kayaking on a saltwater lake in the moonlight, or simply enjoying a pint on the quayside while the fishing boats land their catch. There’s something restorative about the temperate Gulf Stream climate, the peaceful vibe and creative scene, the wonderful artisan food, arts and festivals. And echoing all along this coast is its history: ancient sites, coastal forts and – out on the horizon – ‘Ireland’s tear drop’, the Fastnet Rock. You can now pick up your very own Wild Atlantic Way passport; a unique souvenir of you or your family’s completed journey along this exceptional route. Not only is it a genuine passport to paradise, it also gives you the chance to meet locals in the many towns and villages dotted along this winding coastline. Your passport will serve as proof that you’ve travelled this astonishing 2,500km length of coast, and also enables you to obtain your ‘Wild Atlantic Way Certificate’, the official record of your journey. Pop into any Post Office on the Wild Atlantic Way and pick up your passport.